We’d love your help. Let us know what’s wrong with this preview of Follow the River by James Alexander Thom. Mary Ingles was twenty-three, married, and pregnant, when Shawnee Indians invaded her peaceful Virginia settlement, killed the men and women, then took her captive. For months, she lived with them, unbroken, until she escaped, and followed a thousand mile trail to freedom--an extraordinary story of a pioneer woman who risked her life to return to her people. To ask other readers questions about Follow the River, please sign up. Is this appropriate for a 10 year old girl? I was wondering if somehow I could read this for free. Any suggestions? Dana Library! That is how I got my copy. There is both a written and audio copy available and your local library may have both! This is very good historical fiction. We are given a true story that captures our interest from page one. What happens is exciting and the story is hard to put down. Dialogs enliven events and capture temperaments of the people involved. These dialogs may be fictional, but they conform to what source material tells us about the respective characters' personalities. The book is both adventure story and character study. What made this book so special for me is that I felt what Mary felt. When she This is very good historical fiction. We are given a true story that captures our interest from page one. What happens is exciting and the story is hard to put down. Dialogs enliven events and capture temperaments of the people involved. These dialogs may be fictional, but they conform to what source material tells us about the respective characters' personalities. The book is both adventure story and character study. What made this book so special for me is that I felt what Mary felt. When she froze, I had to pull a blanket over myself. When she was starving, all I could think about was food. You think I am exaggerating, but I am not! Not only were Mary Draper Ingles’ physical deprivations felt by me but also her emotions. I felt her anger, her need to fight for her dignity, her sense of total aloneness, her despair and how crushing was the realization that her travel companion could (view spoiler)[never be trusted (hide spoiler)]. In this novel we look at friendship and betrayal. This was for me the most important component of the whole book. We look at the bond between mother and child and between mother and spouse. A choice must be made. Ultimately the book is about inner strength. The journeys, first when Mary was captured and taken to the Shawnee camp and then her journey of escape, beg to be discovered. What exactly happened on these journeys? What happened when she lived with the Shawnee? What did she see and feel and experience? What did she learn of their customs and beliefs? Mary was captured in July 1755. She was 23, a mother of two and heavily pregnant with a third child. In December of the same year she had returned home - emaciated, bruised, broken, naked and white haired. This is her story. There are no two souls closer than predator and prey. Their relationship is of central importance to my appreciation of the book. This review has been hidden because it contains spoilers. To view it, click here. I found this book incredibly interesting. The amount of research author Jim Thom put into this novel almost reveals an obsession he must have had with the harrowing experience of Mary Draper Ingles. I was educated at a very young age by my archaeologist father about the early settlements of this region, as well as the life of period Indian tribes. Being a true Kentucky blue-blood, I was also educated on the clash between the two, the eternal struggle, and God-willing, those few who were able to I found this book incredibly interesting. The amount of research author Jim Thom put into this novel almost reveals an obsession he must have had with the harrowing experience of Mary Draper Ingles. I was educated at a very young age by my archaeologist father about the early settlements of this region, as well as the life of period Indian tribes. Being a true Kentucky blue-blood, I was also educated on the clash between the two, the eternal struggle, and God-willing, those few who were able to live peacefully side by side. Though this novel falls short from expressing the hardships and horrors the settlers (and more so the soldiers from all campaigning countries) placed on the Indians, you have to keep in mind that it is written from the settlers' perspective. If you take it a step further and do the research on who these early settlers of this yet wild, untamed, and dangerous part of the country were, you'll develop a respect for their plight and for the bravery in which they chose to set out and have a legitimate life of their own. Sunday, July 8, 1755, Draper's Meadow, Virginia. The Shawnee Indians launch a surprise attack on the settlement, killing most, but taking some prisoners, including a very pregnant Mary Draper Ingles and her two young sons. The captives are taken on a long journey to Shawnee Town, where they are somewhat assimilated into the community, Mary is sold as a slave and her sons are *adopted* by one of the Indian chiefs. Mary rebels at being another man's slave and yearns to escape and return home to he Sunday, July 8, 1755, Draper's Meadow, Virginia. The Shawnee Indians launch a surprise attack on the settlement, killing most, but taking some prisoners, including a very pregnant Mary Draper Ingles and her two young sons. The captives are taken on a long journey to Shawnee Town, where they are somewhat assimilated into the community, Mary is sold as a slave and her sons are *adopted* by one of the Indian chiefs. Mary rebels at being another man's slave and yearns to escape and return home to her husband, and she and Dutch woman Ghetel finally get their chance to leave - but there's a terrible cost involved - winter is coming on and it is a long long way back to Draper's Meadow. "On the eleventh day of their freedom they had to walk five miles upstream and then five miles downstream to get around another creek that had barred their progress up the bank of the O-y-o." "There were not even any worms now. There was no soil at the river’s edge, only rock. And up the slopes; the ground had hardened with cold; if there were earthworms in it, they had burrowed deep." Mary Ingels and her story is a true one and you can read more about her on the internet if you care to spoil yourself. I enjoyed this book, and found Mary's story fascinating, but take fair warning - this is not the book for everyone. Mary faces some very difficult decisions before setting out, decisions that might not sit well with some readers. The conditions on the return trip and what Mary and Ghetel are forced to endure and things they are forced to eat are not pretty, and the author doesn't pull any punches sugar-coating it. 4/5 stars. FTC, Kindle edition obtained via library loan. 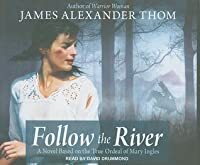 I chose to read "Follow the River" by James Alexander Thom not so much to be entertained and inspired by the story of Mary Ingles’s escape in 1755 from Indian captivity and her torturous return from the Ohio River to her family’s frontier settlement west of the Blue Ridge Mountains. I had read about her ordeal, it being a true story, years ago. I wanted to see how Thom dealt with what I anticipated would be two major difficulties: description of her surroundings and portrayal of her thoughts and I chose to read "Follow the River" by James Alexander Thom not so much to be entertained and inspired by the story of Mary Ingles’s escape in 1755 from Indian captivity and her torturous return from the Ohio River to her family’s frontier settlement west of the Blue Ridge Mountains. I had read about her ordeal, it being a true story, years ago. I wanted to see how Thom dealt with what I anticipated would be two major difficulties: description of her surroundings and portrayal of her thoughts and emotions. Being that Mary was isolated so much and that she was forced to trek through wild, diverse terrain, I recognized that surmounting these difficulties would be a substantial achievement. Thom explains at the end of the book that he traveled Mary Ingles’s route home as part of his research. Not surprisingly, his description of her surroundings is genuine, readily believable. Included in much of his description is sharp sensory imagery, derived, I am certain, from close personal observation. "Thunder grumbled, lightning flickered on the horizon, and as the clouds climbed, a blast of damp air shivered the surface of the river and turned the leaves of the forest white side up. Soon the thunderheads dominated the whole sky above the river; they came gliding across, their undersides lowering and dragging gray veils of rain under them. Birds and insects fell silent." Equally impressive is Thom’s ability to describe Mary’s physical suffering, so necessary to evoke reader identification and empathy. In this passage near the end of the novel Mary is scaling a steep incline between two immense, vertical pillars of rock. "She hung there for a moment, saw a leafless dogwood sapling two feet above her head. She got her numb left hand up to it and around it, forced the fingers to close, and pulled herself, panting and squinting, a little further up, her naked abdomen and thighs scraping over snow and rock and frozen soil, her cold-petrified toes trying awkwardly to gain traction." Thom’s ability to narrate Mary’s thoughts and emotions is equally vital to the success of the novel. One aspect of her thought processes is her wavering allegiance to God. How could a benevolent, omnipresent Lord countenance the horrors she had witnessed and the miseries she daily endured? I appreciated especially these thoughts, which follow her successful ascent of the steep incline partially described above. "She lay with her face against the frozen dirt and had her say with God. Lord, I’ll thank’ee never to give me another day like this if I grow to be eighty. No one deserves a day like this. This is the most terrible day I’ve had in a hell of terrible days and I’m no’ grateful for it. Now give me the strength to make my way across and down this devil’s scarp. Do that and then maybe I can make peace with’ee." The detail of Mary’s ordeal makes the novel fascinating. Adding considerably to the tension of Mary’s situation is the presence of her companion, an unstable, middle-aged Dutch woman who becomes homicidal. Each chapter presents a specific conflict that is a component of Mary’s overall battle to survive and reach her destination. The story never loses momentum. At appropriate places Thom’s narration touches the reader’s emotions. I was especially moved by Mary’s leaving-taking of her infant child, born during Mary’s early captivity. "Her hot tears were dropping on the baby’s forehead and would awaken it; little frowns were disturbing its face and its little beak of an upper lip sucked in the soft red lower lip. Mary couldn’t stop herself. She kissed the little mouth and then, with anguish that would surely kill her, she rose to her feet and stumbled, tearblinded, to the edge of the camp, her lungs quaking for release, her throat clamped to hold down the awful wail of despair that was trying to erupt." "Follow the River" deserves high praise. It's gruesome at times, but such a powerful, realistic retelling of an incredible, true story. It really moved me and I'm sure I will read it again. Mary Ingles is one of my heroes now! I happened upon this book through the band in which I play. One of the songs we perform (written by one of my bandmates) was inspired by this book, which tells of the story of Mary Ingles (no relation to Laura Ingalls Wilder), who was kidnapped, along with her children, in a Shawnee indian raid on her village in Virginia in the late 1700's. She was taken to an area of Kentucky near Cincinatti, and, along with a Dutch woman named Gretel, escaped the Indian encampment (leaving her son and newly bo I happened upon this book through the band in which I play. One of the songs we perform (written by one of my bandmates) was inspired by this book, which tells of the story of Mary Ingles (no relation to Laura Ingalls Wilder), who was kidnapped, along with her children, in a Shawnee indian raid on her village in Virginia in the late 1700's. She was taken to an area of Kentucky near Cincinatti, and, along with a Dutch woman named Gretel, escaped the Indian encampment (leaving her son and newly born daughter) and followed the river, along the Ohio and myriad other rivers, through the Allegheny mountains, back to her home in Virginia. That feat is amazing in itself, but Ingles and Gretel made the 1000 mile trek on foot with only a tomahawk and the clothes on their backs. Thom's book begins quietly enough, but once the raid begins, the tale is epic and near overwhelming in scope. His description of settler and Indian culture, and especially the landscape along Mary and Gretel's trek is detailed and evocative. I had the good fortune of meeting James Thom last October in Rabbit Hash, Kentucky, as well as his wife, Dark Rain Thom. James Thom told me that his wife was instrumental in getting a fair telling of the tale, as from the Ingles side of the tale, the indians were heathen savages, but with the indian side of the tale told, these raids and kidnappings were part of a retaliation toward the white settlers for similar attacks on their people. The Author's notes at the end of the book are equally as moving in Thom's dedication to telling the story so well (Thom hiked many of the places that Mary Ingles travelled in his research for the book, as well as took accounts from Ingles' descendants to flesh out the story). I absolutely loved the first 40% or so. It was full of action, suspense, drama and had me glued to the book. But then it plateaued hard. Like really hard. And stayed that way until the end. It was such an abrupt change I had a difficult time keeping my full attention on the story. So it started as a strong 5 star book then slowly dropped to a 4 and when the journey home made the book feel like it was 1,000 pages long I finally ended with 3 strong stars. The most amazing thing about this story is that it really happened. In 1755, Mary Ingles was captured by the Shawnee and taken to Ohio or thereabouts. After a couple of months, she escaped along with an old Dutch woman. With winter coming on and virtually no food/clothing/shoes, they made their way over very difficult terrain back to Virginia, where Mary was reunited with her husband. They traveled about 1,000 miles. The only thing I couldn't figure out was how she managed this trip without dying of hypothermia. This author is a meticulous researcher. His historical fiction is impressive. In preparation for writing the book, he actually spent several weeks following the terrain Mary Ingles traveled, so the details of the ordeal felt very real. This was FANTASTC!! I stayed up to 3:30 am to finish it last night. Could not stop reading. I have a thing for this time period so I really liked it. What made it even better for me was that it was a true story. Unbelievable what the heroine went through. I listened to “Follow the River” by James Alexander Thom with my husband. We were both fascinated by this fictitious account of the kidnapping of Mary Draper Ingles by Shawnee Indians in 1755. Living in Draper’s Meadow, Virginia, Mary, possibly pregnant at the time, her two sons, Thomas (4) and George (2), and her sister-in-law Betty, and a male neighbor were ambushed and taken captive. Mary gave birth to a daughter as the Shawnees traveled with the captives along the Ohio River finally coming t I listened to “Follow the River” by James Alexander Thom with my husband. We were both fascinated by this fictitious account of the kidnapping of Mary Draper Ingles by Shawnee Indians in 1755. Living in Draper’s Meadow, Virginia, Mary, possibly pregnant at the time, her two sons, Thomas (4) and George (2), and her sister-in-law Betty, and a male neighbor were ambushed and taken captive. Mary gave birth to a daughter as the Shawnees traveled with the captives along the Ohio River finally coming to their village. Here, Mary and her sons were separated. Mary eventually is brought to Big Bone Lick, Kentucky and it is here that she decides she must escape and find her way back home to Virginia and her husband, Will. Along with another captive woman known as “old Dutch woman”, Mary begins the journey home, over 500 miles of wooded terrain with little food or supplies. If this doesn’t attest to the human spirit I don’t know what does? We both loved the story and if we had any complaint is that it was a bit too long, the author explaining the happenings of each of the over 40 days Mary and Getel were on their journey. Perhaps this was his intent, as this was no small feat and no easy trip, and our wanting to get to the end could be nothing to compare with Mary’s want for the same. The narrator, David Drummond, does a nice job in capturing the mood and the characters. There are author notes included on the last disc outlining what is known about the fate of all, the real Mary Draper Ingels, and why he chose to write his novel the way he did. I think he gives fair representation to the Shawnee and their point of view. His decisions in the narration offer many discussion points and I found myself debating some of these with my husband. We chalked some up to male/female differences on how we see motherhood, home and family. This was a book, along with others by Thom, that I read decades ago, but I did remember parts of it and wanted to read it again. Happening very early, before the USA formed as a separate country- and with the protagonist, a woman- it was and is "different" to the more common period pieces. It's brutal as life was. 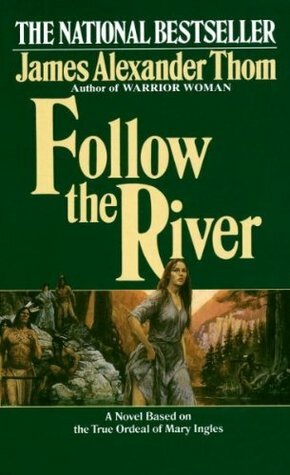 And it's fiction, but based on a real life woman's history of being kidnapped and then returning to her own people eventually by a long on foot trip down a 1000 mile river. This time I This was a book, along with others by Thom, that I read decades ago, but I did remember parts of it and wanted to read it again. Happening very early, before the USA formed as a separate country- and with the protagonist, a woman- it was and is "different" to the more common period pieces. It's brutal as life was. And it's fiction, but based on a real life woman's history of being kidnapped and then returning to her own people eventually by a long on foot trip down a 1000 mile river. This time I did not read slowly, but skimmed parts. I was surprised by the length of pages for the return trip and the starvation lengths of the tale- I had forgotten how severe and stark that was. Quite apart from the terrible losses she suffered. This book frustrated me- Although it is based on a true story, it is clearly written by a man. ..... There was and extreme lack of womanly/motherly emotion described in events that would more than evoke such feelings from the main character, and it left her(in my eyes) less realistic and relateable(despite the fact this really did happen)........My mother made me read this one, and although it got off to a decent start, I lost interest and desire to continue reading by about page 175, and felt a This book frustrated me- Although it is based on a true story, it is clearly written by a man. ..... There was and extreme lack of womanly/motherly emotion described in events that would more than evoke such feelings from the main character, and it left her(in my eyes) less realistic and relateable(despite the fact this really did happen)........My mother made me read this one, and although it got off to a decent start, I lost interest and desire to continue reading by about page 175, and felt at that point in the story, it lacked motive to continue for another 250+ pages. I was curious though about this woman's survival story in history, so I finished it, but was not altogether pleased with my spent time! It was also a tad too violent for me- It contained some very dreary and descriptive parts of things that occured during some of the indian raids on American settlers-I'm obviously a baby, because I found my self skipping a couple paragraphs every now and then to avoid these disturbing details of violence. I just can't handle it when it's happening to children-So sad. Even though this is listed as historical fiction, it is actually based on a true survival story of a woman named Mary Ingles (no, not Little House on the Prairie) who was captured by Indians in the 1700's. I read this for book club, plus, I have always wanted to read it. Some stories take a while to set up, but not this one. From the first page I was pulled in. It started off perfectly and I wondered why I hadn't read it before now. The characters were easy to like, even Gretel. I was really cap Even though this is listed as historical fiction, it is actually based on a true survival story of a woman named Mary Ingles (no, not Little House on the Prairie) who was captured by Indians in the 1700's. I read this for book club, plus, I have always wanted to read it. Some stories take a while to set up, but not this one. From the first page I was pulled in. It started off perfectly and I wondered why I hadn't read it before now. The characters were easy to like, even Gretel. I was really captured by Mary's story. She was a young mother and just the thought that she had to endure the kidnapping, her new life and her escape was hard enough, but the fact that so did her children really tugged on the heart strings. She had no power to protect them. There were some parts during her escape, that I started thinking, "Okay already....Enough. Let's move on." I felt there was enough info given to get the picture, but it seemed to go on and on about certain aspects. So, the repetition was a little irksome. However, overall, I enjoyed this story. I read this for book club. I never would have picked it up on my own. The writing is not great, but the story (based on fact) is gripping and I'm still thinking about it a year after reading it. This novel is based on the true story of Mary Ingles, a young frontier woman living in western Virginia in the 1750s at the onset of the French and Indian War. Their settlement was at the far fringes of colonial development and vulnerable to attack from the Shawnee Indians. Many in her settlement were massacred, but Mary, very pregnant and about to give birth, her sister-in-law, her two young sons and another man from the community were kidnapped and taken deep into Shawnee territory well beyon This novel is based on the true story of Mary Ingles, a young frontier woman living in western Virginia in the 1750s at the onset of the French and Indian War. Their settlement was at the far fringes of colonial development and vulnerable to attack from the Shawnee Indians. Many in her settlement were massacred, but Mary, very pregnant and about to give birth, her sister-in-law, her two young sons and another man from the community were kidnapped and taken deep into Shawnee territory well beyond any place that English settlers had ever ventured. This is the story about what happens when she is living with the Shawnees and how she escapes and finds her way back to her beloved husband where she then renews her life living well into old age. She endures far beyond what would be thought to be survivable during those six weeks of walking home. Her strength, fortitude and determination are both inspiring and heartbreaking. As a reader you share her triumphs, her sorrows, her pain and suffering and her dreams to ultimately find her way home against absolutely insurmountable odds. Wow, what a story. I just do not think that many men or women today would have that kind of frontier spirit. Amazingly based on a true character and events, this is the harrowing story of Mary Ingels who is kidnapped by the Shawnee along with her children and is forced to undertake a perilous journey through unchartered wildnerness to reach home. It's is compelling reading in parts and the violence and grittiness of the times is well portrayed. Much of the heartache that Mary endured as a wife and mother wasn't adequately described. However her bravery and fortitude shone through. I feel humbled by Mary Ingles' story. It is truly amazing. There were parts of the book I felt could have been shorter and almost gave it four stars because of that, but then I worried that somewhere out in the cosmos it would offend Mary Ingles....;). This story is truth that is more unbelievable than fiction. Fantastic. Before there was Cheryl Strayed's Wild, there was this story. In 1755 a young, married, and heavily pregnant woman was captured by the Shawnee Indians, with her two sons, and taken from Virginia to near present-day Cincinnati. She escaped her captors, and WALKED home, about a thousand miles, with another captive woman, arriving just this side of death, after about six weeks. What I really liked about this story is the sensual details are deep but not excessive. I FELT hunger (enough to eat bugs), Before there was Cheryl Strayed's Wild, there was this story. In 1755 a young, married, and heavily pregnant woman was captured by the Shawnee Indians, with her two sons, and taken from Virginia to near present-day Cincinnati. She escaped her captors, and WALKED home, about a thousand miles, with another captive woman, arriving just this side of death, after about six weeks. What I really liked about this story is the sensual details are deep but not excessive. I FELT hunger (enough to eat bugs), cold, wounds and sore feet. Felt fear of being recaptured, the bond formed between the two women on the trail, fear of losing the way, the grim determination. I also liked that this book neither whitewashed the Shawnee as "noble savages," nor portrayed them as anything other than intelligent, complex human beings, while still portraying these clashes from the point of view of the early white settlers. We can (and I do) dispute the whole manifest destiny and white supremacy idealogy that led to driving Native Americans from their own homelands, but at the same time, I think it's useful to understand the mindset of the time. I didn't finish this book. When I finally decided to put it down I just bawled like a baby. The author, in the first chapter, writes a descriptive scene of a baby being tossed around while an Indian in the middle tries to chop it with his ax, in the end, the Indian succeeds. If that wasn't bad enough, The main character lets her three children, including three week old baby be taken in by the culture of the Indians. As a mother who has lost a child, I found this extremely unrealistic and upsetti I didn't finish this book. When I finally decided to put it down I just bawled like a baby. The author, in the first chapter, writes a descriptive scene of a baby being tossed around while an Indian in the middle tries to chop it with his ax, in the end, the Indian succeeds. If that wasn't bad enough, The main character lets her three children, including three week old baby be taken in by the culture of the Indians. As a mother who has lost a child, I found this extremely unrealistic and upsetting. I have heard it described as a very heroic and inspiring tale, and many of you may be able to read it without the heart wrenching agony I felt. I read this book not too long after it was first published in 1981, so I'll looking back a long way to review it. The Indian attack and kidnapping was quite harrowing, but her attempt to survive after escaping the Indians by following the river was also pretty harrowing. After reading the book, I did some research, and found out that it actually is possible for someone's hair to turn white "overnight." And the things that happened to her as she tried to stay alive and return to her family were eno I read this book not too long after it was first published in 1981, so I'll looking back a long way to review it. After reading the book, I did some research, and found out that it actually is possible for someone's hair to turn white "overnight." And the things that happened to her as she tried to stay alive and return to her family were enough to have done it. I read the book while living in West Virginia, just over the hill from the branch of the river she followed to return home. I tried to superimpose the descriptions of the land she travelled through onto what I would see as I'd go about my daily errands, and I wondered what she would have thought if she could have seen what I saw. Read this for book club, so I plowed through it so I could have it finished by tomorrow night. Well, all I can say is WOW! I am exhausted from reading it. I couldn't put it down, but I also didn't want to pick it up. It is a very detailed description to a horrible nightmare. Once you get started on her journey home, you don't want to put the book down because you want her to get home so badly. I just hope we can read something uplifting and fun for book club soon! I wish I had been warned about the first chapter. As a mother with children about the same age as Mary's, it was one of the most difficult things to read. I give this book four stars, because page after page of hunger, cold, and physical pain, became a bit tedious, so I skimmed through the last part. I wish that the author had spent more time on her adjustment back into her community and with her husband. Mary's story is remarkable, however, and definitely worth reading! This book is based on an incredible true story. I couldn't put it down! 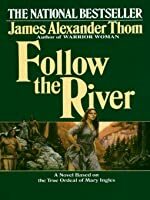 James Alexander Thom (born 1933) is an American author, most famous for his works in the Western genre. Born in Gosport, Indiana, he graduated from Butler University and served in the United States Marine Corps. He is a former professor of journalism at Indiana University, and a contributor to the The Saturday Evening Post. His fifth wife, Dark Rain Thom was a member of the Shawnee United Remnant James Alexander Thom (born 1933) is an American author, most famous for his works in the Western genre. Born in Gosport, Indiana, he graduated from Butler University and served in the United States Marine Corps. He is a former professor of journalism at Indiana University, and a contributor to the The Saturday Evening Post. His fifth wife, Dark Rain Thom was a member of the Shawnee United Remnant Band until its dissolution; the Thoms presently live in the "Indiana hill country" near Bloomington.